Tiger farming is a major driver in stimulating consumer demand and perpetuating the illegal trade in tiger skins, teeth, bones, claws and meat from tigers and other Asian big cats. This is despite a crucial decision from the Conference of the Parties to the Convention on International Trade in Endangered Species (CITES) that tigers should not be bred for trade in their parts and derivatives and tiger farms should be phased out. The demand for tiger skins, teeth, bones, claws and meat is perpetuated by the legal and illegal supply of parts from captive tigers. There are more than 7,000 captive tigers in China, Thailand, Laos, Vietnam and South Africa. Facilities range from small backyard holdings to circuses, from collections masquerading as zoos to battery farming-style operations holding more than a thousand tigers. The preference among many consumers for authentic wild specimens means that wild tigers and other big cats are still poached. Governments should have phased out these tiger ‘farms’ following an international agreement in 2007; instead, the problem has escalated. We first raised the alarm over the growth of tiger farms in 2001 with a report on the situation in Thailand. In 2007, we worked with like-minded NGOs and governments to secure a critical decision at the 14th Conference of the Parties to the Convention on International Trade in Endangered Species (CITES) – tigers should not be bred for trade (including domestic trade) in their parts and derivatives, and tiger farms should be phased out. Our work has been vital in keeping this issue on the international agenda as governments have failed to implement the decision. Our research, investigations and analysis have countered the pro-tiger farming advocates, showing how tiger farming undermines conservation, exposing the duplicity of China’s so-called domestic trade ban and revealing a licensed trade in skins of captive-bred tigers that is stimulating demand. We have also advocated legal reform in China to end domestic trade, mapped the growth of tiger farming across South-East Asia and into South Africa and documented how the those involved in tiger farming are often part of organised criminal networks trafficking a variety of wildlife. Our efforts have led to a new process under CITES that we hope will finally lead to an end to tiger farming. Under a project funded by the UK Government through the Illegal Wildlife Trade Challenge Fund, we and partners Education for Nature Vietnam and Wildlife Friends Foundation Thailand will continue to investigate the shadowy figures behind tiger trade and farming between Thailand, Laos, Vietnam and China, some of whom are involved in global illegal wildlife trade. We will share information with enforcement agencies and spur them to action. We will also continue to apply pressure through CITES on the five tiger farming countries of concern. 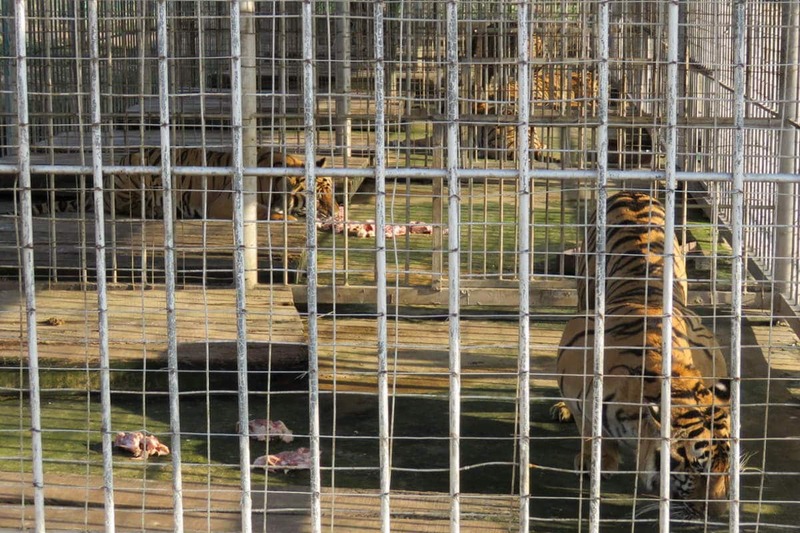 Under threat of CITES trade suspensions, Laos is conducting an audit of tiger farms as a first step towards a phase-out plan. To date, most of the Government focus has been on two particular operations. We have urged it to add facilities at the Golden Triangle Special Economic Zone and Laksao to its itinerary. We will work with other NGOs and experts in running genuine sanctuaries to urge Laos not to simply convert the farms to amusement parks but to consider alternative options. We are currently feeding the findings of our research into a special review process under CITES which includes formal missions to countries of concern. This should be concluded ahead of a meeting in October 2018 at which CITES Parties will call for time-bound, country-specific actions to end tiger farming and trade. We and our partners will be there to push for tangible action to stop further breeding, conduct full audits of captive tigers, develop phase-out plans, destroy stockpiles of tiger parts and send a clear message that trade in tiger parts – indeed, in any big cat parts – will not be tolerated. The London Conference on Illegal Wildlife Trade, also in October 2018, provides another opportunity for China, Vietnam, Thailand and South Africa to follow Laos and commit to phasing out tiger farms. We will be working with the UK Government to set high expectations. Don’t visit animal parks that allow visitors to take selfies with tiger cubs or adults. These places are often hiding a far more sinister truth. Write to your Prime Minister/President and urge them to call on the leaders of China, Thailand, Laos, Vietnam and South Africa to end tiger farming. Your gift today will help us continue our vital investigative and campaigning work.